QUICK TAKE: It’s not easy being a middle school kid. 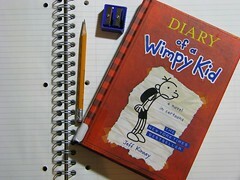 Just ask Gregory Heffley, the narrator in Jeff Kinney’s Diary of a Wimpy Kid: A Novel in Cartoons. The boy who figures he’s “somewhere around 52nd and 53rd most popular” in school relates an entire year of fun and mishaps in his journal. Using simple prose and comic storytelling, Greg relates his return to school in the fall, his disastrous Halloween night, his catastrophic winter play, and … well, you get the idea. Greg adds to his account by sketching pictures on most of the pages. Those line drawing cartoons are often punchlines to the stories. I’m well past middle school age but I can see why this chapter book (series, in fact*) is popular with kids. It’s a tale of their world told (presumably) by one of their own. And it’s pretty funny. * A second book, Diary of a Wimpy Kid: Rodrick Rules is already out.